The only thing wrong with the Mindfulness for Teen Anxiety workbook is that it wasn't written 30 years ago. I say this as someone who suffered a great deal from anxiety in high school and college, and who wishes I’d known then what I know now about mindfulness. The author, Dr. Christopher Willard, is a psychologist who specializes in working with adolescents and young adults. He knows how to present information in a way that’s understandable to kids but doesn’t talk down to them. There are 51 activities, so teens could do the workbook as a week-by-week program, either on their own or in a counseling context. The first section explains what anxiety is, what triggers it, and how it can affect our bodies and moods. Creating an “anxiety record” to track specific triggers throughout the day. The next section introduces a variety of mindfulness practices and explains how they can help reduce anxiety. Section three focuses on potential anxiety triggers at home, such as financial pressures, arguing parents, or tension with siblings or roommates. Using progressive muscle relaxation to prepare for sleep. Section four is about stressors at school, such as class presentations, test anxiety, writer’s block, and the dreaded cafeteria. The final section shows how to cope with social life, including dating, peer pressure, and helping a struggling friend. The message throughout the book is nonjudgmental. It could be summarized as: there’s nothing wrong with you; it’s normal to feel anxious sometimes, especially in certain circumstances; here are some strategies that can help. Let’s start getting this workbook into the hands of the kids who need it. 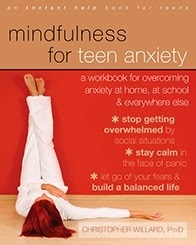 Mindfulness for Teen Anxiety is part of the Instant Help series from New Harbinger Press. Interview with author Dr. Christopher Willard on Best Practices in Teaching Mindfulness to Children. Review of Child’s Mind: Mindfulness Practices to Help Our Children Be More Focused, Calm, and Relaxed, also by Dr. Christopher Willard.